It's a banner day for space exploration today (April 12), as the era of human spaceflight marks its 50th anniversary while NASA celebrates its own 30th anniversary of the first space shuttle flight. However, the momentous day also comes at an awkward time for NASA. There is currently no replacement for NASA's space shuttle. The agency plans to turn the task of flying astronauts to the International Space Station over to private companies so the agency can focus on building a new spaceship capable of taking humans to the moon, an asteroid and Mars. NASA administrator Charles Bolden plans to announce today which museums will receive the retired space shuttles after they go on their final flights. NASA is also dealing with uncertainty in the short term, as its 2011 budget, along with that of the rest of the federal government, has not yet been decided. The agency was about to fly an extraordinarily different – and more ambitious – vehicle than any spaceship that had flown before. Previous spacecraft, such as those flown in Apollo and by the Soviets, were capsules that launched atop rockets, and splashed down into the ocean or on land. In contrast, the shuttle lifted off using its own rocket engines, along with two strap-on boosters, and then glided down on a runway for landing. In addition, NASA was sending the shuttle on its very first test flight with two men on board. All previous spacecraft had gone through unmanned tests before they were trusted with astronauts. But in order to be recovered safely, the shuttle had to fly manned for its maiden trip. So when astronauts John Young and Bob Crippen launched on Columbia's STS-1 voyage, even they didn't know for sure what to expect. "Truthfully, I wasn't all that confident," Crippen told SPACE.com about his feelings prior to launch. "You know, it's a very complex vehicle and a lot of things have to happen correctly for actual liftoff to occur. All in all, the vehicle flew much better than what a lot of people, including us, probably anticipated." During that flight, and on many subsequent trips, the space shuttle impressed with significant achievements. 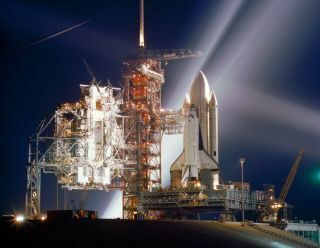 Eventually, the shuttle fleet would be instrumental in building the world's largest space habitat — the International Space Station, and launched the Hubble Space Telescope, arguably the world's most famous space observatory. And the shuttle Discovery became the world's most flown spacecraft, having completed 39 flights to orbit and back. But the shuttle program also weathered some withering defeats. NASA lost the space shuttle Challenger and its seven crewmembers on Jan. 28, 1986, when the shuttle was destroyed just after launch. Then, on Feb. 1, 2003, the space shuttle Columbia and its seven astronauts were lost when the orbiter broke apart while re-entering the Earth after a successful orbital mission. Both disasters shook the space agency to the core, but ultimately caused vital improvements to the shuttle program. Now, looking back on the highs and lows of the 30-year space shuttle program, astronauts say the anniversary of its first flight is cause for celebration, as well as a tinge of sadness that the shuttles are soon to be retired. "We're right now floating in a module that was brought up on the shuttle, as well as many other parts of the station here," NASA astronaut Cady Coleman said from the International Space Station on Monday (April 11). "I think these things we have gained from the shuttle are intangible and yet so important. And one of the most important is what the space shuttle does for young people. The younger generation is inspired by that and I see our future richer for it. I'm sad to see the shuttles go and at the same time, I'm excited to see our next steps." By coincidence, NASA's first shuttle launch blasted off 20 years after the very first human spaceflight, the liftoff of Soviet cosmonaut Yuri Gagarin on his Vostok 1 spacecraft. The day that Gagarin launched, April 12, 1961, marked a significant step for mankind, as well as a powerful boon for the Soviet Union in its space race against the United States. "Many people contributed to that first human flight to space and a new era started on that day," said the current space station commander, Russian cosmonaut Dmitry Kondratyev, from space on Monday. "It's of great significance to the development of all humankind." The anniversary day still holds special significance for Russia, where it is celebrated every year as Cosmonautics Day. "It’s a wonderful coincidence that [the first shuttle flight] also coincided with the 50th anniversary of the first human in space," said current space station flight engineer Ron Garan of NASA. "We're going to celebrate in probably the best place you possibly can — that's on orbit, looking at our beautiful planet." And from down on the ground, many who were involved in those momentous flights plan to take a moment out to commemorate today's milestone. "It was a real honor for me to be able to be part of the shuttle program through its development up through being in industry and helping it operate," Crippen said. "I'm very proud of it and I think probably after we ground the shuttles, we'll recognize that we probably made a mistake and we're going to miss it."